A clay jug containing silver earrings and ingots, dating back approximately 3,200 years, was discovered by archaeologist Robert Mullins, Ph.D., associate professor of biblical studies at Azusa Pacific University, and his team during last summer’s dig at Abel Beth Maacah. 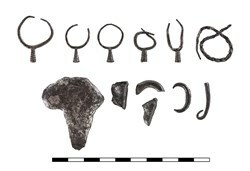 This silver hoard, found at Abel Beth Maccah in Israel, appears to be Late Bronze Age or Early Iron Age. A clay jug containing silver earrings and ingots, dating back approximately 3,200 years, was discovered by archaeologist Robert Mullins, Ph.D., associate professor of biblical studies at Azusa Pacific University, and his team during last summer’s dig at Abel Beth Maacah, a 35-acre tel and the northernmost site in Israel. Details of the discovery of these well preserved artifacts found wrapped in plant fibers, appear in the journal Strata, now featured on Livescience.com. For Mullins, the intriguing discovery confirmed his belief that this biblically significant site, once an ancient guardian city on the border of Lebanon, lies rich with treasures waiting to be unearthed. He anticipates confirming the existence of a large structure, specifically a siege ramp the Assyrian army may have used to conquer the city in 732 BC, as recounted in 2 Kings 15:29, and a city gate complete with an inscription. Azusa Pacific University’s dig at Abel Beth Maacah resumes this summer. Mullins, along with several APU students, will join his co-director, Nava Panitz-Cohen, Ph.D., from the Institute of Archaeology at Hebrew University; and their team of archaeologists and scholars from partner schools, including Cornell University, Trinity Evangelical Divinity School and Indiana Wesleyan University.